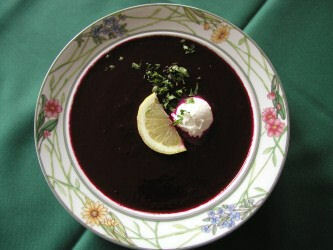 From the Oxford House Inn in Fryeburg, ME comes this tangy & fresh beet soup! It looks gorgeous as a first course! Peel, cut up in chunks & boil about 4 or 5 fresh large beets till soft. Strain & mash them with salt & pepper. Add 1 can or 2 cans of beef broth (depending on size of beets), ¼ cup honey & ¼ cup lemon juice to mashed beets. Put all in a blender or half a batch at a time if you have a small blender. Blend. Add more honey, lemon juice & salt & pepper to taste as needed. Serve cold or hot with a dollop of sour cream and some fresh chopped parsley.